“Eliza Waite” by Ashley E. Sweeney is the story of Eliza, born into a family that would do anything to protect their image, even if it meant harboring dark secrets. Unfortunately, one of their darkest secrets involved her. Eliza’s father makes arrangements with a preacher, offering him a great sum of money to marry Eliza, raise her son, and take her with him, far away from their home. Living on an island in Washington, Eliza has a loveless marriage, however, she makes up for it with the love that she has for her son. When disease strikes the island, one-third of the residents are killed within a month, including her husband and son. Heartbroken at the loss of her son, Eliza moves into an isolated cabin and spends her time alone, so that she can be near the grave of her son. She only sees a few people who come to visit, and she meets others when she paddles into town for supplies. In time, Eliza meets a man who is destined to break her heart, and he does. Deciding that it is time to leave her island and venture elsewhere, she packs up a few meager belongings, including a picture of her son and a stack of treasured recipes. She journeys up to the Klondike, where she sets up a relatively prosperous bakery, and befriends some colorful characters, including a Madame. Eliza enjoys her life in this town, however, it takes a while before she finally starts feeling her frozen heart melt and begin beating again. Her friendship with Pearly the Madame, has taught her a lot about herself and her desires. She is finally able to love again, and desperately hopes that those feelings will be returned. Meanwhile, as she is processing this, life around her is moving on and she realizes she should move on as well. 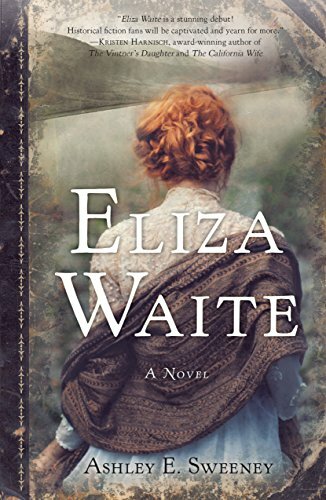 “Eliza Waite” is a beautifully written historical novel. I found myself totally caught up in the story. Eliza’s character was born ahead of her time. She is an independent woman, living during a time where this was unusual. She also has a deep connection with nature, and doesn’t allow the rigid Christian beliefs that she was raised with to try to break that connection. This novel was obviously well researched and the author intersperses many old recipes into her story. These recipes were a treat to see, but also made my stomach growl continuously as I read! “Eliza Waite” by Ashley E. Sweeney is the perfect choice for a reader’s group. The author even includes some questions for discussion at the end of the book. I truly hope she continues with Eliza’s story in another book!